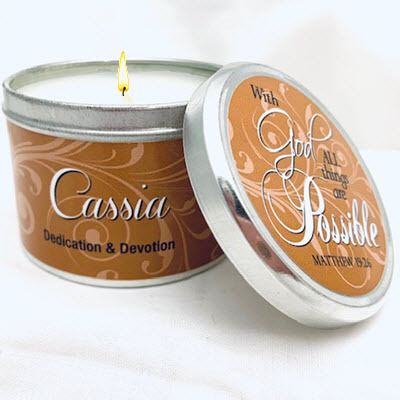 Home → CANDLES → Scripture Tins → Cassia Scripture Tin -"With God all Things are Possible"
Cassia Scripture Tin -"With God all Things are Possible"
Be encouraged and uplifted with this Cassia candle displaying the powerful scripture verse from Matthew 19:26 : "With God ALL things are possible". Our special soy-blend formula burns clean and gives hours of enjoyment, making this candle a wonderful gift for under $10! Approx. burn time: 12-16 hrs.